A mother who held her two-year-old daughter under a scalding hot shower causing fatal injuries has been jailed for six years. Toddler Kristiana Logina died two weeks after being scalded at her home in Harborne, Birmingham, in February 2010. Her mother Eva Logina and her former partner Rashpal Chana were earlier convicted of manslaughter at Nottingham Crown Court. Chana, a magistrate for 18 years, has been jailed for four-and-a-half years. A statement from the Office for Judicial Complaints said Chana had not sat as a magistrate on the Birmingham bench since the death of Kristiana. "In light of his conviction and sentence, consideration will now be given to his removal from the magistracy," a spokesperson added. The pair did not seek treatment which could have saved Kristiana, the court was told. 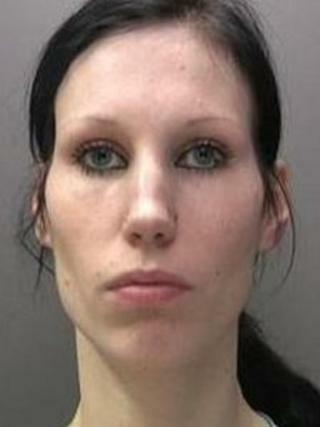 The jury also found Logina guilty of child cruelty. Jurors were told that Kristiana died of septic shock after she suffered 10% burns when she was held under the shower by her mother, a Latvian national who came to the UK in 2007. The water temperature could have reached 58C (136F). Kristiana's burns were left untreated for so long the damaged skin eventually died and began to decay. Jurors heard the shower system started off with boiling hot water and then gradually returned to a normal temperature. Logina was scared that if she sought medical attention for Kristiana she might have both of her children taken away from her by social services, the court heard. Judge Mrs Justice Dobbs accepted the initial scalding injuries had not been caused deliberately. She told Logina during sentencing on Tuesday: "It's always a tragedy when a young life is cut short." She added: "One cannot escape the fact that the underlying reason for your not seeking medical help was a selfish one." Logina, 25, currently of High Street, Smethwick, and Chana, 49, of Dibble Road, Smethwick, applied creams to the injuries but did not seek further treatment. They claimed they had not realised that the toddler was badly injured. Prosecutor Timothy Raggatt QC said: "It's one of the awful tragedies of this case that her death was completely avoidable and, had she received medical treatment at or around the time of those injuries, she would have survived." The prosecutor added that Kristiana had been injured between 10 days and a fortnight before her death at Birmingham Children's Hospital. The likely cause of her injuries was from a shower head unit or extremely hot water, he said. Chana had shared his former home in Tennal Road, Harborne, with Logina. Kristiana soiled herself, according to what Logina told police, when the couple were living together at the property. She was angry and put the girl in the shower, Logina told officers. Det Insp Bob Sutton, of West Midlands Police, said it had been "a very lengthy and difficult investigation". He added: " A two-year-old girl lost her life in the most tragic circumstances. "The most distressing thing is that the court heard how Kristiana's life could well have been saved had Logina and Chana sought medical help immediately. "I hope that the sentences the couple have today received offers some comfort to relatives." Birmingham Safeguarding Children Board confirmed that a serious case review had begun.